In addition to the visible/near IR 2/3” compact C-mount lens family from Schneider Optics, there are two 5-megapixel lenses for 3.45-micron pixel sizes. There are two 1” format lenses that cover an image circle of 16 mm. And there are a number of 1.3” format lenses that cover an image circle of 22 mm. 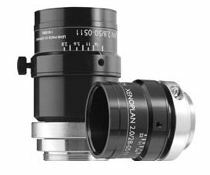 Some of the 1.3” Format Lenses are Image Sided Telecentric Lenses, which are specifically designed for use with sensors with MicroLenslets. The Image Sided Telecentricity brings collimated light rays to the sensors so that each ray hits orthogonally to the MicroLens, eliminating shadowing or vignetting in the corners. The APO-Xenoplan 2.0/20mm, APO-Xenoplan 2.0/24mm, APO-Xenoplan 2.0/35mm, and the Xenoplan 2.8/50mm lenses are all part of the Image Sided Telecentric Family.